The Processing Division is comprised of four teams. These four Teams are assigned to 12.25-hour rotating shifts that alternate on a twenty-eight day cycle between days and nights. This division processes approximately 33,000 inmates a year; more than the entire South Carolina Department of Corrections. The initial contact with the detention setting can be and often is a very difficult experience to an arrested person. It is extremely important that security procedures are followed to ensure the safety of the person arrested, the arresting officer, and facility personnel. Detention Center personnel are committed professionals who will take every opportunity to provide necessary information to a person under arrest. After charges are reviewed and it is determined that a person is to be committed to the Detention Center, a search must be accomplished. All searches of inmates by SACDC personnel are conducted with maximum respect and minimum physical discomfort to the inmate as allowed by safety and security considerations. Officers use only the force necessary to affect the search to assure that contraband does not enter the facility. The SACDC facility is the only facility in South Carolina to have a 287G program which is a two year Federal contract with Immigration and Customs Enforcement (ICE). The 287(g) program requires all foreign born inmates to be interviewed by a 287(g) officer either at the time of intake or at the time of releasing using the ENFORCE Program. The inmate will be fingerprinted by the 287(g) officer and the fingerprints will be processed through the Integrated Automated Fingerprint Identification System (IAFIS) and IDENT system to ensure proper identity. If the inmate is in the country illegally, he/she will be served an I-247 form and detained for ICE custody. Custody of the inmate will be transferred to ICE upon completion of local and state charges. To ensure that all inmates' property is accurately accounted for, an inventory is accomplished for the inmate's review and signature. Property is securely stored. All inmates are photographed and fingerprinted. Then each inmate is assigned a pin number which allows them access to the telephones and commissary. Newly admitted inmates are permitted at least two free telephone calls during the Intake/Booking process. All other telephone calls made by inmates are collect. Inmates are then interviewed by our classification department to determine if they have enemies, co-defendants, gang affiliations, or request protective custody. 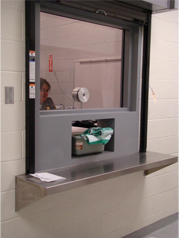 The information collected is utilized, along with other information, to decide an inmate's custody level and housing assignment utilizing the Northpointe objective classification system. These officers also orient inmates with the Detention Center's Inmate Handbook. The inmate will proceed to the screening nurse located in the processing area. The nurse will verify all the inmates' medical information provided during the admission process, obtain the inmates medical history, and address any concerns that need immediate medical attention. Once the inmate has completed all of these areas the inmate will await their bond hearing. Our Bond Hearing Department consists of four officers who coordinate inmate appearances before the Bond Judges. 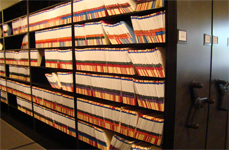 They ensure all paperwork is accurate and entered into the Jail Management System (JMS) in a timely manner. 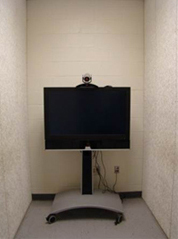 All bond hearings are conducted via video conferencing to alleviate inmate movement outside of the facility. Friends or family may attend their bond hearing at the Centralized Bond Hearing office located at 3870 Leeds Ave Suite 106 North Charleston, South Carolina 29405. The final step in the processing of an inmate is having the inmate dressed out. Our dress-out department is responsible for issuing all uniforms, linen, and personal hygiene items. The inmates' clothing, personal and valuable property will be safely secured in our designated property storage rooms. Access to this room is restricted to only authorized personnel to ensure property is protected. Our facility does not have the space to store excess property and if an inmate is brought in with excess it is returned to the arresting officer for storage. This division is comprised of four teams and each team consists of a Sergeant and four civilians. The division is overseen by the Processing Lieutenant. The responsibility of this division is to interpret and process all court-issued commitments, bonds, and orders. In addition they ensure all sentencing documentation for inmates are maintained in an accurate and timely manner, and ensure the effective and timely release of inmates. This division is responsible for maintaining all inactive inmate files, preparing all General Sessions bonds, and preparing and verifying all jail times for released inmates. 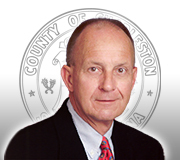 In addition they are responsible for all expungements and preparing inactive files for transfer to the Charleston County Records Center. This division is comprised of one Sergeant and fourteen detention officers. This division is responsible for preparing and ensuring inmate movement from the Sheriff Al Cannon Detention Center to court, medical facilities and other facilities for appointments. They account for every inmate leaving and returning to the Detention Center. All transfers of inmates to the South Carolina Department of Corrections, Federal Prisons and other facilities in or out of the state are processed through transportation. The Charleston County Sheriff's Office is committed to assisting victims and witnesses of crime in a fair, compassionate and dignified manner. Agency personnel will ensure that victims and witnesses of crime are afforded all the rights and entitlements provided by law. Section 16-3-1530 in South Carolina Code of Laws states that, a department or agency having custody or custodial supervision of a person accused, convicted, found not guilty by reason of insanity, or adjudicated guilty of committing an offense involving one or more victims reasonably must attempt to notify each victim, upon request, of the person's release, escape or transfer. Detention Center Victim Services is staffed by civilian Victim Advocates and supervised by the Victim Services supervisor. Detention Center Victim Services is responsible for notifying victims when their accused offenders have been released from the facility under any circumstance. Victim Services uses the V.I.N.E. (Victim Information Notification Everyday) telephone system to assist with notifications. Victims are registered with V.I.N.E., an automated computer program, which makes an immediate notification when an inmate is released or transferred to another site. By using the V.I.N.E. system, a crime victim can also check on the status of their accused offender at any time. The caller will need the inmate number or first and last names. To register with V.I.N.E., call (866)727-2846 and follow the automated instructions. A touch-tone telephone must be used to register for automated notification. V.I.N.E. will ask for a telephone number and a four-digit PIN code. You should select a PIN that is easy to remember. Also, you may enter more than one telephone number to ensure that timely notification is made. If you move or change telephone numbers after registering, call the Charleston County V.I.N.E. line to change your information in the system. When V.I.N.E calls to make notification, enter the four-digit PIN selected upon registration to verify that you have been notified. Once the PIN is entered, the system will provide information regarding the inmate. If a PIN code is not entered when V.I.N.E. calls or an answering machine picks up, V.I.N.E. will continue to call the registered telephone number for up to 24 hours, until a PIN code is entered. V.I.N.E. 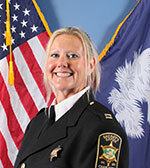 is a free and confidential service provided by the Charleston County Sheriff's Office. For additional information regarding the V.I.N.E. system or assistance in registering for V.I.N.E., call the Detention Center Victim Witness Office at (843)529-7471. For further information on any other services provided to crime victims, call the Charleston County Sheriff's Office. This division is responsible for ensuring all inmates receive their personal and valuable property at the completion of the releasing process. In addition, the officers are responsible for property release and organizing inmate property for transfer or long term checkout. The Sheriff Al Cannon Detention Center allows inmates the opportunity to work at various government agencies, non-profit organization, and within the facility. These inmates volunteer to work during their incarceration and are screened carefully by the facility prior to being placed in the work detail program.